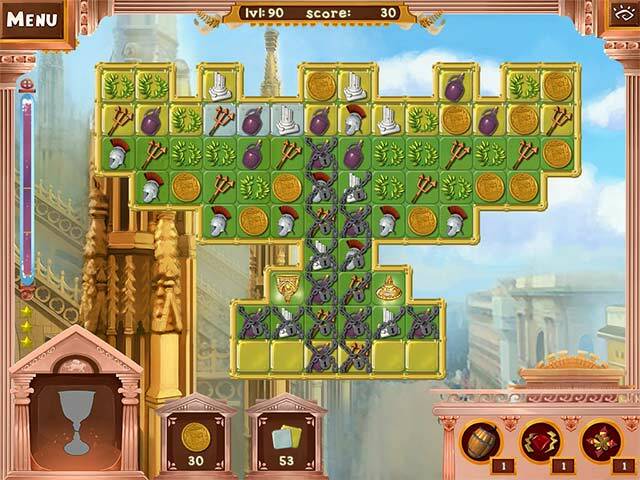 The Eternal City of Rome awaits you with riddles and challenging puzzles. 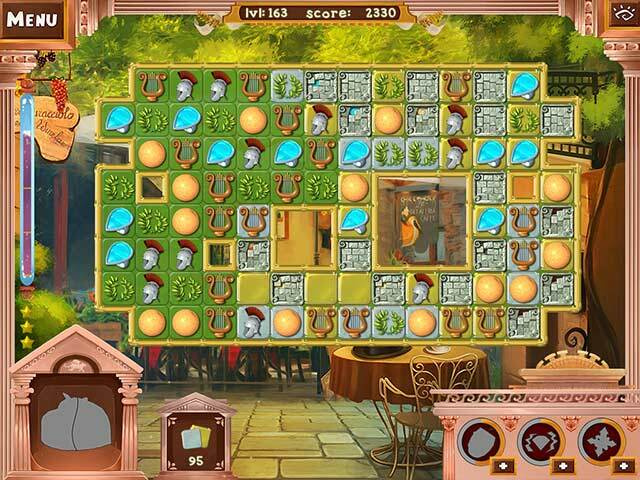 Collect more than 80 artifacts on this awesome match-3 adventure while travelling to the most beautiful sights. Mighty power-ups will help you set the highest score. Visit the miraculous fields of Tuscany, romantic channels of Venice, beautiful streets of ancient Milano and don’t forget to have a cup of tea in the Sicilian café after leaving Vesuvius and Naples. Your journey around the world continues! Welcome to Italy! 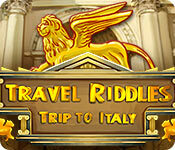 Travel Riddles: Trip To Italy is rated 4.0 out of 5 by 18. 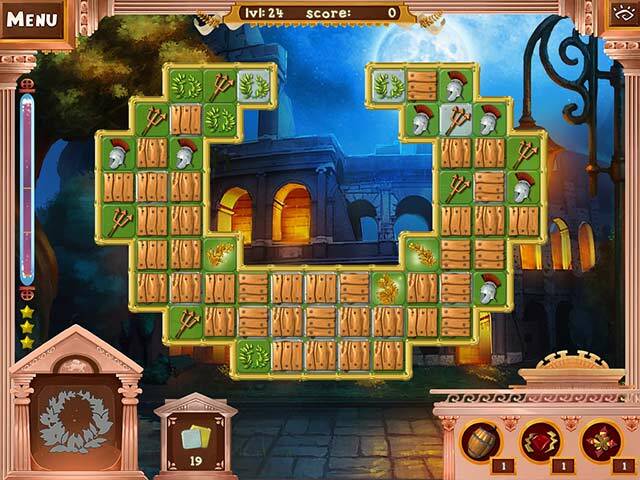 Rated 5 out of 5 by match3lover from Addictive I have loved playing this game. I completed it yesterday which is probably a record as to my shame I do tend to weary of match 3 games after a while and forget about them. It's the first one I've completed in this category. I was therefore tentative about buying this one but I am so glad I did. I'm not bothered about a storyline although building between levels is okay but not essential to me. I dislike games which have puzzles and HOGS between levels. I never use my speakers when playing a game as I have my own music as a background. I play relaxed. Not only is it more relaxing but more challenging to me. I may be in the minority here but I love searching for the most strategic match like the X4 and X5 matches or where to use the power ups that come down the board. I also find it a challenge to see how far I can get in the game without using any of the power ups at the bottom right as and when they appear. That is what I find most pleasurable. I'd find it boring to just beat the clock. In the later stages of this game there are some big boards so it's quite challenging getting the artefacts to the bottom and releasing all the tiles. That is one special feature I like about this game. It records at the bottom left how many tiles are still to be found. It's so useful to know that. The other feature I like is the hanging barrel on your cursor when you run out of matching tiles. As the game progresses this is a lifeline as you can cure a lot of problems with it. My only tiny gripe is when you are stuck and can't find a match the tipster or hint mechanism could be a little better defined. I find it hard to spot especially on the big boards. Buying power ups in the shop is an interesting addition which I kept forgetting to explore! But it's a good idea as I'm currently trying it out on the Greece travel game. I have skipped the India game in the series as there is no relaxed mode which is essential the way I prefer to play. I love the big clear attractive tiles in the game and the backgrounds. It looks amazing on a widescreen PC. Thank you for days of great entertainment. Rated 5 out of 5 by deddu from Great Match 3 One of the best. It gets harder along the way but you can purchase power-ups. Rated 5 out of 5 by jil1 from Great M3!!! Loved it... Really funny game. When you start you don´t want to stop... and play... and play... and play... and want more... Beautiful colours and bright, the difficulty is get money to buy power-ups, but, even though you go far... I recommend this game. Rated 5 out of 5 by ecblisa from This game is much underrated This is the kind of Match-3 game that is hard to evaluate until you have played it a long time. It starts out easy, and you get lots of power-ups that make it fun to get out of mildly difficult situations. Gotcha! By the time you get to the last third of the game, the difficulties mount and the power-ups seem puny. If, like me, you used up all your power-up money as it came in, you'll join me in being sorely disappointed: there is no more free lunch now. I started a second game with a different strategy: Use power-ups very sparingly, solve difficulties the hard way, and save money for later. It seems to be working, but this is a very long game. I don't know if any reviewer has actually finished this game, but the truth is it gets very, very nasty -- I mean that in a good way -- with constant new obstacles being served up at the player. I see this as a true strategy game, at least in the second half. Just one example and to keep it from being a spoiler, I won't give exact details: In some levels, you have to collect, let's say, 20 coins. When you start the level, all the coins are encased in ice and the temptation is strong to blast them out of the way. When I did that, I found that those were the only coins that would ever appear on that level, so I had to start the level over and carefully gather them all. As this example shows, mindless playing is not a good strategy. In a highly chained level, you might need to collect only one type of token, and that may be possible without using power-ups to get rid of all the chains. It really helps to focus on the goals for each level, I highly recommend this game to players like me who actually like a good Match-3 and aren't tempted to say that it's too easy based on half an hour or less of play. This one presents interesting challenges, especially in the second half, and should provide many hours of deliciously frustrating fun. Rated 5 out of 5 by twinsoniclab from Great fun! I seldom submit a main page review, and this is the first time I repeat my forum review, but this game is due so much more than it's getting! So, as I said in the forums: I can only say what I said about Travel Riddles: Trip to India... "I feel like I must have demoed a different game! I like this one. It isn't the best of the best of the Match-3s, but it is one of the good ones." Well worth spending money, not just a PCC, on! Like Trip to India, the game is fun, and fast. You can make matches while tiles are still in motion. This is an important element missing in many match-3 games, and I won't buy without it. You collect artifacts by moving fragments down and off the board. There are power-ups to help you. Some fill as you play, some are on the board, and others you can purchase with the gold you accumulate during play. You also need to clear certain tiles, or find "so may of" different tiles, such as coins, laurels, or knives. The tiles are big, colorful and clear. I am playing on a small laptop, with just Vista, while my "real" computer is being repaired (tripped on it's cord, landing it on the floor) with no problems. The timed mode is perfect so far, with a few levels just making it in time! That's the fun of it for me. You can also choose no timer. As levels progress they become more difficult. Crates, rock walls, ice blocks, etc. impede your tiles decent. Eventually you will have to use power-ups to blast away cannon balls or lava. If you run out of moves, no worry. You get a power-up to blast away some at your choice of location so you can carry on. The only negative I can think of is the music. It alternates between epic Star Wars-eque music and what sounds like Irish folk ballads! Definitely no Italian vibe to the music. The best thing? (Other than ability to match while tiles are in motion) No interruptions to gather crops, chop wood, or build a mill! This game is pure match-3, and I thank them for it! Rated 5 out of 5 by kdubs from Liking this M-3 From the screenshots I wasn't too sure but I was quickly taken in when I saw it was from same dev as Tricks and Treats -- one of my favorite light-hearted M-3. The tiles are reasonable in size, the board action is smooth, the mechanic is typical swap M-3. Music is varied, sometimes more adventurous and sometimes what I think of as more sedate. There are 7 locations (episodes) -- they are locked until prior levels are complete. It starts with Rome. If each of the other 6 episodes have same structure as Rome, then it offers plenty of play. There are powerups to purchase, pieces of the 'artifacts' to lower to the bottom of the board, and stars to earn. There's a nice screen which shows your stars and artifacts. The first two levels are somewhat tutorial. I found the information offered (when I slow down enough to read it) is perfectly adequate. Then again I usually just play and figure stuff out as I go. After the 2nd level, you can select Timed or Relaxed. For purposes of the demo, I played timed and never even came close to missing 3-stars. At least in the beginning, it is very generous with coins so you can purchase those powerups. Although this is no brainbending 'cradle' type M-3, it is very attractive and I found it fun. I intend to get it today. Rated 4 out of 5 by layla69378 from excellent but for me 1 drawback I bought this game after playing and buying "trip to France" which was very enjoyable. Trip to Italy however has a drawback for me in that when there are no moves it automatically puts your bomb power up on the board. I like to choose whether to use a power up or to restart the game -I generally restart unless I have collected lots and lots of bombs. Perhaps this does not bother others but it really irritated me . Other than that a great game .